I have just been told by my consultant at the hospital that my appeal for funding my GRS has been successful. I wanted to say a very big Thank you x million for all your kind thoughts. I never expected the wonderful news I received today. My journey has become very spiritual to me. Mum & I have shared so many tears but I never ever dared dream she would be alongside me supporting me & willing me to be able to have this surgery. Today our prayers were answered. Bless you for helping that to happen. PS Please excuse the slightly bizarre photo. It was from April 2007 before my beloved parents had even agreed to meet Debbie & were still in denial. 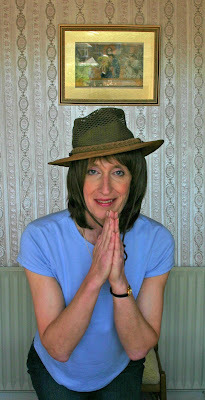 They were continuing to ask me not to transition while they were alive & I was praying for a miracle. Rather like my safari head wear we have all been on a very long journey & come a very long way. Actually from reading your blog over the past few months this post has brought a tear to my eye, a joyful one. Wow have you come down from the ceiling yet? You now have the end of your gender limbo in sight. "This is not the beginning of the end, but the end of the beginning." As its the beginning of a new life for you. Did we all dare to expect that !? Simply fantastic news...I am SO SO happy for you. Sat her smiling in the office...you really deserved this news, and this is a real answer to your prayers. You don't know how equally joyous I feel for you, Debbie. Wonderful, simply wonderful! I'm soooo excited and happy for you. I'm sure getting this news and having the support of your mom next to you has you floating on the ceiling:) all I can say CONGRADS. FANTASTIC Debbie. I'm really crying at this wonderful news. HUGE HUGS AND LOVE. You earned this Debbie!!!! Oh joy! I am beaming on hearing the news:) . As others above so rightly say its deserved. Now it's my tears flowing with happiness and joy at these wonderful words! And I didn't think the photo bizarre at all, I liked it! Especially the smile and the sparkle in your eye! I hope they are soon permanent! I am still flying so high. I still wake up at night just to make sure I did not dream it. Then I break into the biggest of smiles, when I realise you actually can live your dreams. I happen to believe in Miracles, and I knew this day would come! I'm so happy for you! Awesome news! Now I'll start saying my not so silent prayers that your surgery day will come and go with nary a problem!